To make an informed decision, you should understand how plants use light, especially from artificial light sources. We are going to deconstruct a few myths in the industry to help you identify the best grow lights on the market. If you see this quote, run! 🙂 Some LED companies say that the reason why LEDs are more efficient than High-Pressure Sodium bulbs is because plants don’t use yellow or green light. In other words, the reigning champion of grow lights for several decades, the mighty High-Pressure Sodium, is putting out a lot of “wasted light”. What? Here’s what the LED companies haven’t been telling you. There’s a phenomenon known as the green gap for narrowband LEDs — they can’t create green, yellow or infrared wavelengths very efficiently. So when you look at the graph below, you’ll suddenly understand why we have purple grow lights. It’s because red and blue are the only colors narrowband LEDs are good at making! Also notice how narrowband LEDs only create very small “points” of color, which is why you might see 8, 10, or 12 bands being advertised as a full spectrum led grow light – it’s a company’s way of trying to deal with LED technology developed in the 1990’s. 📌 Truth: LEDs are more efficient than HID bulbs because they create light directly from electricity, and do not have to heat up a bulb. Here is where the LED company will pull out their favorite chart – the Chlorophyll A/B absorption graph (see “Pigment Extract” in the below image). They’ll show their spectrum on top of this chart and say that they’re giving plants only the colors of light that they can absorb, or 100% usable light!!! Sounds great right? It’s more like a marketing trick. Remember the colors that narrowband LEDs could create from Myth #1? Notice how red (~650nm) and blue (~450nm) conveniently coincide with the colors most absorbed by the “Pigment Extract” which is Chlorophyll. In actuality, the leaf itself is absorbing more than just red and blue. Green and yellow light (500-600nm) are getting absorbed by the leaf, too. In fact, these colors are very important for the full development of the plant since that is what they experience when growing under the sun. If you look closely at the graph, notice how different parts of the plant leaf absorb varying portions of light. The “Chloroplasts” are the centers of photosynthesis — notice how much green, yellow, and orange they absorb. Green doesn’t just “bounce off” of the leaves after all! If you can imagine green and yellow light as the “free agents” that can slip by Chlorophyll A/B to other parts of the leaf, think about how a red and blue spectrum could fail. Red and blue light cannot easily penetrate past the first few layers of plant cells, into buds, or to the leaves below because Chlorophyll A/B is blocking those colors! See the illustration below where the narrowband Red/Blue LED having most of its light blocked by the leaf (e.g. Chlorophyll A/B) whereas HPS or broadband light penetrates past the canopy through to the leaves below. || This image and quote come from a study where Red and Blue LEDs failed to produce the same results as High-Pressure sodium because of the lack of canopy penetration. If you’re in for a read, check it out. 📌 Truth: Plants absorb and use much more than red and blue light. In fact, other colors are critical to its development! This myth originates from the ritual of switching between Metal Halide (MH) and High-Pressure Sodium (HPS) bulbs when transitioning from the vegetative stage to the flowering stage of growth. Growers use MH because it has blue light which is needed to prevent stretching. HPS bulbs have more yellow/orange light, which is important for rapid growth during flowering. Neither of these bulbs is designed for plant growth, but each is more suitable for a certain stage of plant growth than the other. Since growers are in the habit of switching bulbs between veg and flower, LED companies provide two spectrum modes to increase marketability. Usually, the veg mode is almost 80 percent blue light. Studies show that giving your plants mostly blue light during veg is wasting the potential of your harvest. Your plants will grow slower, create smaller leaves, and won’t be prepared to grow big for the final yield. 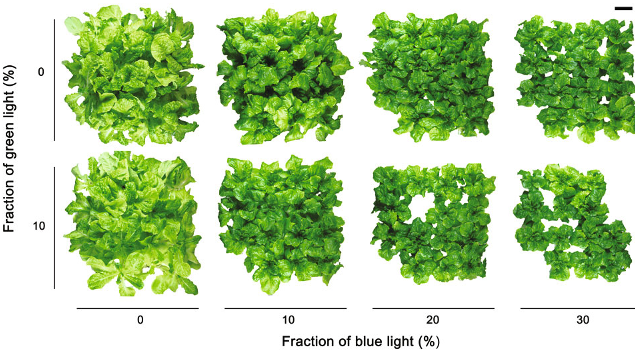 Check out the image below illustrating the vegetative growth of lettuce under varying amounts of blue and green light. Watch what happens when blue light passes about 20 percent — the plants shrink! Think about the results that you might get from a grow light with more than 50 percent blue light. LED companies that “match” the chlorophyll A/B graphs will provide this much blue light, seriously decreasing yields. For curious minds, check out the study (quoted below) here. || As the fraction of blue light increased, leaf size and plant growth decreased significantly. However, while the addition of green light considerably reduced the leaf photosynthetic rate, it did not reduce plant growth. Unless you’re an advanced grower who is prepared and educated for what happens with changing the color ratio, you’re looking for one constant and efficient spectrum from start to finish! It’s part of the reason why we created our lighting systems. 📌 Truth: A spectrum that does not change significantly from seed to flower will achieve the best results. First things first, UVB light has shown benefits to certain plants, but only when applied at the correct intensity, for the proper length of time, and at the right time. Otherwise, UV light can be harmful to plants, let alone your eyes or skin — it’s the reason we use sunscreen and wear sunglasses when going outside. All UV Rays can lead to eye damage. If your grow light emits UV, wear eye protection! That being said, if used properly, could UV LED’s help plant growth? It’s a toss-up of whether it’s worth it when reviewing scientific articles. Most UV LEDs actually only produce UVA light, which can be safer and less damaging than UVB. However, the reason why UVB light is beneficial to plants is because it introduces damage and the plant responds with a defense, so UVB light is ideal. What’s more, UV LEDs are not as efficient, more expensive, and burn out more quickly than other LEDs. With that in mind, it bears the question if using UVA LEDs is worth it, especially if that power could be redistributed to colors that are proven to increase plant growth. Some LED companies have realized this and incorporated fluorescent UVB lights into their LED fixtures since UVB has some proven and positive results for certain plant species. Leading UVA/UVB LED supplementation bars last about 15,000 hours (vs the standard LED lifetime of 50,000) and cost hundreds of dollars, whereas a UVB fluorescent bulb such as the T8 Reptisun 10.0 UVB cost about $15 and will last you an entire year if used for the flower period of your grow. 📌 Truth: You can save money and experiment yourself by taking a trip to the pet store and picking up a reptile light! The actual (real input) power draw in watts. When comparing LED lights, always search the specifications of how much wattage the LED light pulls from the wall. || Unfortunately, there are many LED manufacturers that are extremely misleading when using the word “watt”. Watch out, be alert and stay informed. Make sure an LED company is telling the truth when it comes to how many real Watts a light uses. 📌 Truth: A general idea of the intensity of the LED light is how much it uses from the wall. LEDs can beat HPS systems by 30-40%, e.g. a 600Watt LED system could replace a 1000Watt HPS system if the form factor was correct. Any LED company claiming they can replace an HID bulb with 1/3 or 1/2 of the power should be questioned. Lumens are a measure of how bright light is to the human eye. Looking at the graph below, you can see that green/yellow light is the most visible to the human eye, with blue and red light being the least visible. The sensitivity of the human eye to color. 400-500nm is blue 500-600nm is green/yellow/orange, and 600+nm is red..
You may find white LED companies advertising Lumens because they can “beat” the other fixtures that emit mostly red and blue light. A Red/Blue light will score a low amount of lumens. Each color of light has a different efficiency and plays a different part in a plant growth, so we need a plant-centric light measurement as a benchmark. This is called Photosynthetically Active Radiation (PAR), which weights all wavelengths from 400-700nm equally. || Be critical about videos comparing one LED light to another with a PAR meter. Many PAR meters on the market incorrectly read LED lights. If you’re really interested about this, check Apogee Instrument’s presentation. If you’re a grower, you should understand the concept of how light is measured. And hey, pick up a quality light meter! 📌 Truth: PAR output is the correct light measurement for plants, and not lumens. Myth #7: A High Center-Point PAR Reading Means the Brightest Light! Most grow lights are only good at shining light directly below the fixture in a “spotlight”, so the most attractive light reading an LED company can advertise is the highest reading they can measure — the one right in the center of the light. Plants easily burn with this type of focused LED light, which is one of the reasons you may want to pay attention to this reading: If a light is putting out over 800 μmol/m2/s of PAR in the center, that is in the danger zone for burning your plants. You’ll have to raise the light to the point where the center isn’t so “hot”, which actually decreases the brightness for the rest of your grow area. Counterintuitive, huh? || Light distribution uniformity is important! || Look for LED grow lights that evenly cover the entire grow area like our lighting systems. These systems help eliminate plant burn while keeping your entire grow area at a uniform light level. 📌 Truth: You should use the center-point par reading to understand how easily a light will burn your plants. You’ve learned a lot, and now you might even know more than some LED companies! To recap, make sure you look for the actual power draw, a spectrum that gives your plants more than just red and blue, and a lighting system that evenly spreads light over your entire grow area. Learn something new? Let us know by sending us an email!